Being mythic is cool as hell. Characters that get to use the options from Mythic Adventures have the opportunity to take their characters to a whole new level (or, at least, a whole new tier). An important part of that ruleset is Mythic Feats, most of which are powered-up versions of normal feats. While a large number of feats from numerous rulebooks receive mythic versions, not all feats do. The problem with this approach is that it limits the ability of some characters to grow their most prevalent abilities into mythic abilities. Because the rules do not support the idea of mythic metamagic, a spellcaster more interested in maximizing the use of metamagic than in learning mythic versions of spells has no place to put his mythic feat resources. The effect is even worse for characters that focus on combat, as there are very few mythic critical feats, mythic shield feats, or mythic improved maneuver feats, despite the normal versions of such feats often being the focus of entire character concepts. 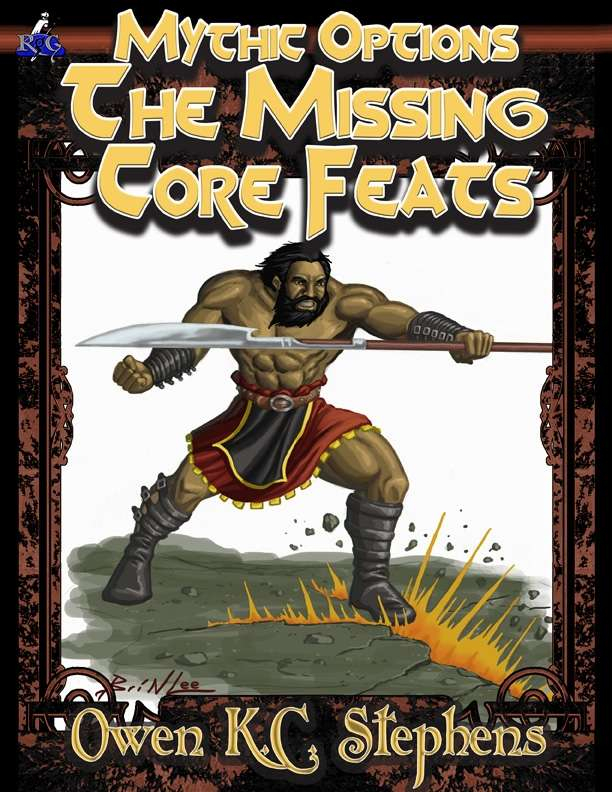 To fill in the gaps and allow ANY character concept to be mythic, we’ve combed through the Core Rulebook, found every feat that lacked a mythic upgrade, and created the first book of missing mythic feats. While there are feats that it might seem silly to have mythic versions of (Simple Weapon Proficiency? ), we didn’t want to accidentally cut player or GM creativity short by excluding anything. So if a character’s concept is that they are the child of a god with a morningstar as a preferred weapon, and as a result the godling child is simply a little better at the use of a morningstar than anyone else, we’re got a feat to represent that! This title was added to our catalog on December 15, 2013.